Is YouTube trying to replace adverts with subscriptions? Would you pay a monthly fee for YouTube? It's not much of a secret that YouTube doesn't make any money for Google. Spend a few moments thinking about it and you'll quickly realise that the costs of operating that site are massive, while the amount of people watching adverts is low, either because they skip them or because they use an ad blocker. That said, YouTube does bring in money. According to Google last year it increased payments to partners by 50% and brought in a fairly substantial $4bn in 2014, which is an increase of $1bn from 2013. So it's hardly a surprise to read in Variety that the company might be looking to roll out general subscriptions. That might all sound very familiar, and there's a reason for this: subscriptions are nothing new on YouTube. For one thing, it's already possible to subscribe to a channel for a fixed fee. You can also rent or buy movies and TV shows via the service, which makes sense given the prevalence of YouTube apps. If all that wasn't complicated enough, there's also a Music subscription service called Music Key that allows you to watch videos without adverts on the service. That's also bundled with the Google Play Music subscription you can buy as a separate music-only service, for £9.99 ($9.99US). 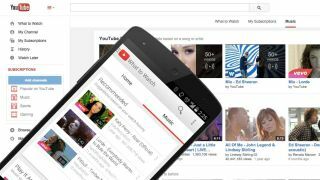 YouTube is, therefore, one of the more complicated services to understand, and expanding that out to Google as a whole, there are a lot of services which have some overlap. For example, Google Music lets you store 50,000 tracks for free but to store those on Google Drive you'd need to pay. Perhaps what Google needs is a one-fee service that offers you streaming music, ad-free YouTube and a chunk of storage for your stuff in the cloud. But here's our question to you: if it meant you never saw an ad again on YouTube, would you pay a subscription? If so, how much would you be prepared to spend per month?